Hopefully you know by now that I love a great meal out. I also enjoy talking about local history and there’s lots of it right here. There’s a third thing which escapes me right now, but what better place to get both than Culp’s Café at Carillon Park. Back in 1902, Charlotte Gilbert Culp, a young widow with six kids, began baking bread, cakes, rolls and selling them by having her children go door to door in their west side Dayton neighborhood. Her baked good became the talk of the town and soon after her eldest son, Howard Gilbert Culp, leased space in the Arcade, and expanded the business selling poultry, eggs, cheese, and dill pickles at three lunch counters where downtown workers could get a complete lunch for 35 cents! 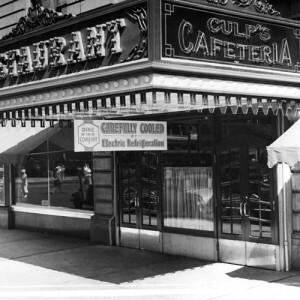 In the 1930s, the Culps opened a cafeteria in the Arcade across from Keith Theater. Dayton’s population boomed in the 1940s and Culp’s Cafeteria served as many as 5,000 customers a day. The Culps eventually sold the business, but the spirit of this family-operated restaurant lives on at Carillon Historical Park with Chef José Calzada managing Culp’s Café 7 days a week, offering a typical menu of the 1940s. Taste tempting fare from soups, salads, sandwiches to historical favorites like malts, shakes and nectar sodas, a Culp’s original by the way. They have daily specials, soup of the day, chili, homemade quiche, open face meatloaf sandwich, world famous garlic mashed potatoes and don’t forget to try the sweet potato fries. HEAVEN! Oh, and they have a great kids menu too. Don’t forget you don’t have to pay park admission to dine at Culp’s, but if you purchase a Carillon Park Membership not only will you experience all the cool things they have to offer, you get a ten percent discount at Culp’s. WAIT! That’s the third thing I love is a discount! Enjoy a great meal at Culp’s with the entire family and tell ‘em the Dayton Convention & Visitors Bureau and Buch sent you! Culp’s, a taste of Dayton History is open daily 11:00 a.m. to 3:00p.m. daily. Located at 1000 Carillon Boulevard, find them on line and a menu too at www.daytonhistory.org or call (937) 299-2277. Please note: The Dayton CVB has compensated me to share my thoughts on Culp&apos;s Cafe.